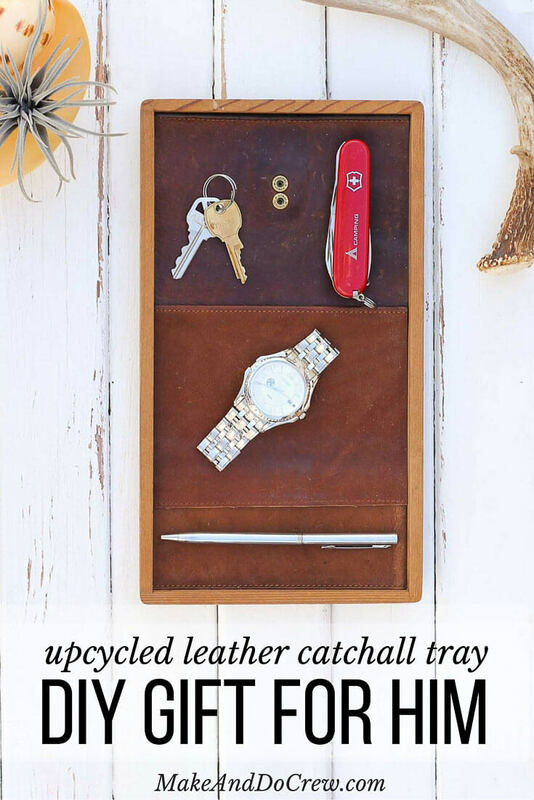 Whether you’re celebrating Father’s Day, Christmas or even your third anniversary, this masculine leather catchall tray makes a perfect DIY gift for him. It’s not always easy to incorporate your man’s personal style into your home decor. One of the most heated, legendary “negotiations” of our relationship took place in the aisles of Home Depot (so cliche, I know) over how we would store Mike’s clothes in our tiny San Francisco studio apartment. He wanted to throw up some plastic garage shelves in the corner. My vote was for a dresser. Spoiler alert: We didn’t buy the plastic shelves. We didn’t buy a dresser either. We moved. 🙂 And although I’m not super into the garage-inside-your-bedroom-inside-your-living-room look, I do try to find ways to incorporate masculine accents into our home decor. For me, that takes the form of a lot of weathered wood, leather and non-frilly wall art. So a few years ago, I was excited to learn that the material traditionally associated with three years of marriage is leather. I was trying to come up with a DIY third anniversary gift idea when I came across a leather wallet with a beautiful, worn-in patina at a thrift store for $1.50. And right there, the idea for creating a sophisticated place for Mike to empty his pockets was born. 1. 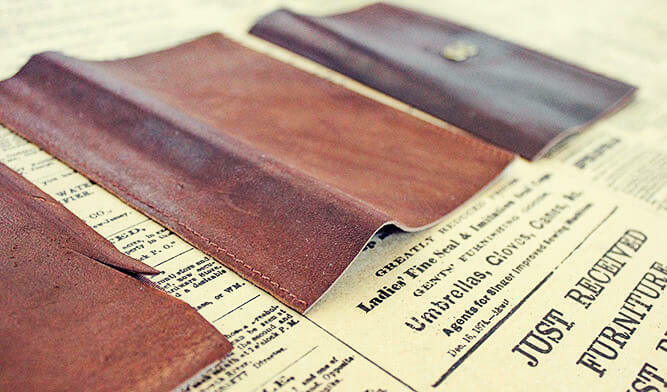 Cut your wallet or purse apart, leaving the biggest sections of leather possible. 2. 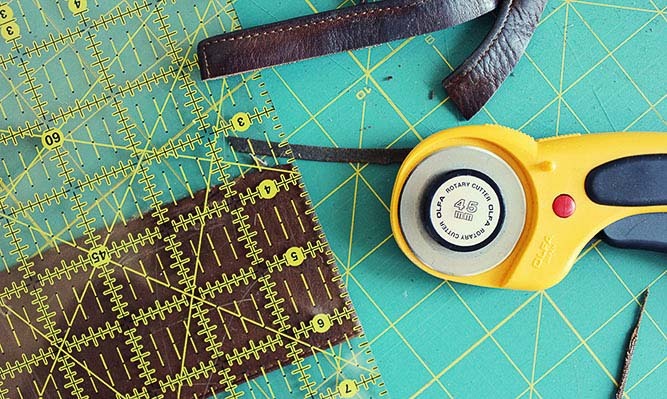 Measure the width of your wood tray and cut your leather scraps to exactly that width. 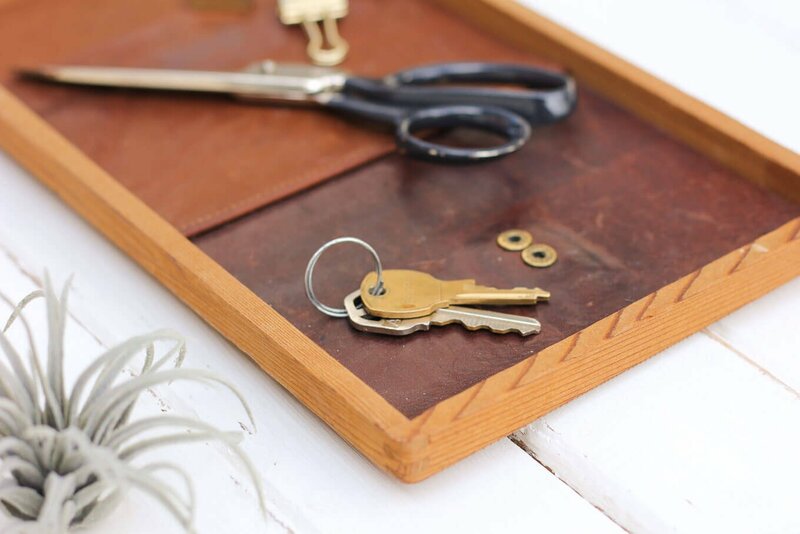 I included the wallet’s brass snaps in my finished tray to keep some of the original charm. 3. 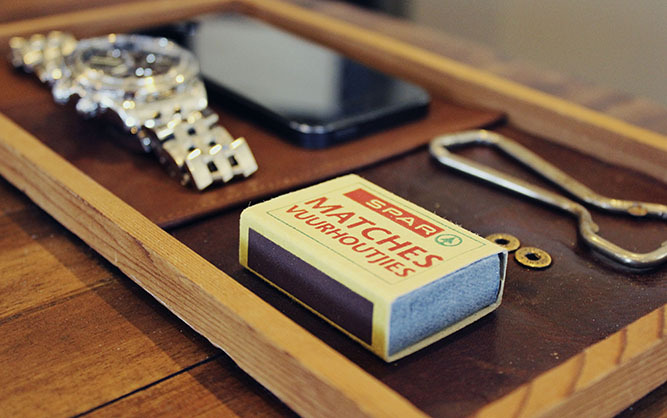 Lay your leather pieces in the tray until you find an arrangement that will suit your gentleman. 4. Glue the bottommost piece of leather down first. Glue additional pieces on top. 5. 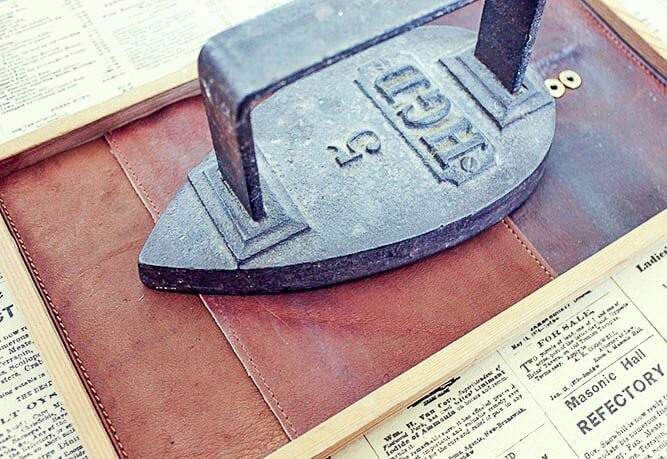 Place a heavy object or book on top of the leather while the glue dries to make sure it bonds well with the leather. That’s it! 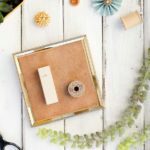 In my experience, DIY gifts for him are the hardest to come up with. Those darn boyfriends, fathers and husbands are just tricky. 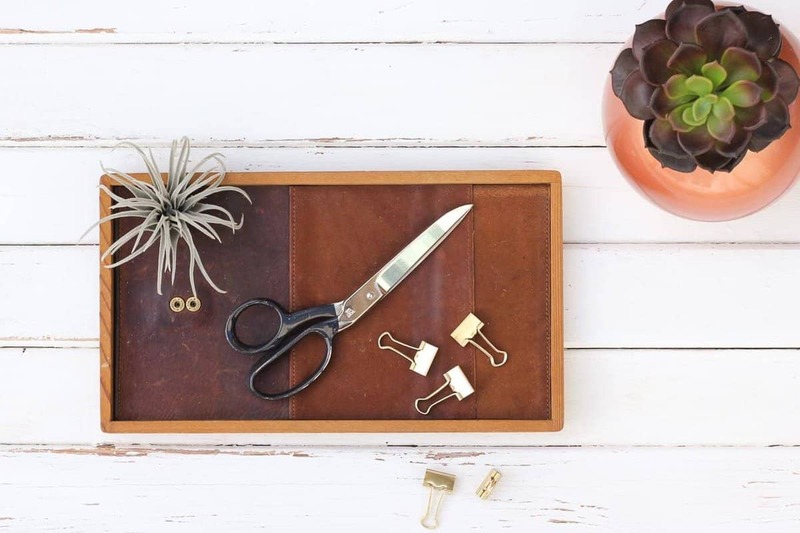 This desk tray a pretty simple third anniversary gift and it would make also make a fantastic DIY Christmas gift for the men in your life. In fact, I’m not sure what holiday wouldn’t be bettered by a snazzy leather tray. Father’s Day, Valentine’s Day, Columbus Day? Yes, yes, and obviously. 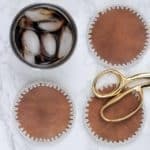 I hope you enjoy making a little DIY project for the sophisticated man in your life and most of all, that he enjoys arranging all of his extremely fancy belongings on it. Hey! I love this craft! I love leather and just made myself some crafts of my own out of it. 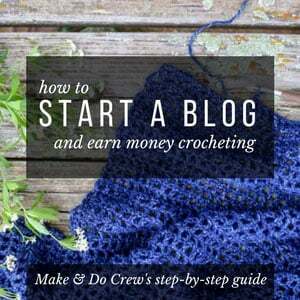 Question: Do you have any tips on photographing your crafts and DIY’s? Mine always turn out rather amateur looking, while yours are so so beautiful. Any help would be appreciated! 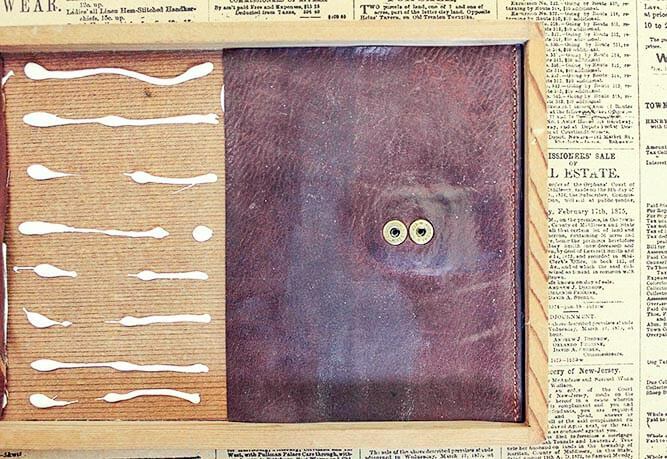 What kind of amazing German craft did you make out of leather? Please tell me you went for the chaps. That’s a great question about photography. I might ask my friend McCall to write a post about it. My biggest tips are to make sure you have lots of natural light and turn off your flash. The flash tends to be a bit of a wrecking ball when it comes to DIY photography. Secondly, I think simply putting your project on a cool background makes a ton of difference in how “styled” it looks. Find a cool tabletop (something matte works best), funky wall or simply some nice brick to shoot your craft against. 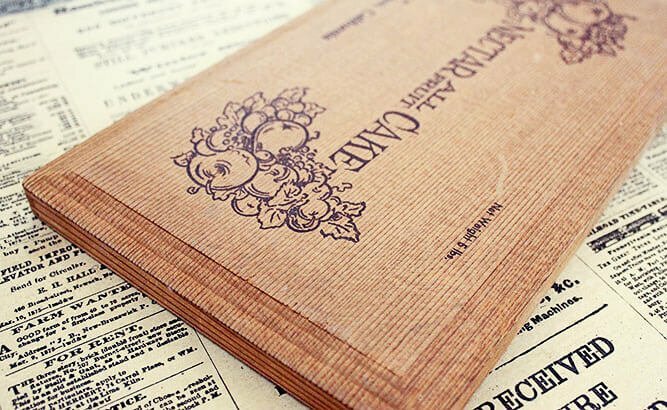 Lovely crafts,I like wooden gifts that’s make me loving .Great collection you have!!! Thanks. perfect size! my favorite part is the button detail!! Thanks Shelly! I like that too 🙂 And I’m taking note of your Disney toddler tips. I’m going to try to put that trip off until my daughters are high schoolers. Ha. Wow this looks really amazing! My husband loved this when I showed it to him. I absolutely bookmarked this so I can try to make this for Christmas! Hey Diana, Hope you enjoy making it! It’s pretty straightforward to make for how snazzy the finished product is. I’d love to see a pic once you make it. Thanks for this brilliant idea! 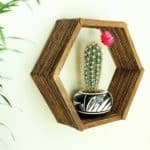 I am going to be making one for my husband for Christmas, maybe it will help keep all his little things from falling onto the floor from his nightstand too! I love your interpretation of a Christmas “wreath.” There’s nothing wreath-like about it, which is what makes it AWESOME! 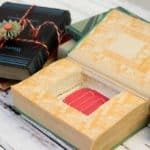 This is such a great idea Jess, I always find myself clueless as to what should I gift my dad when an occasion arrives. 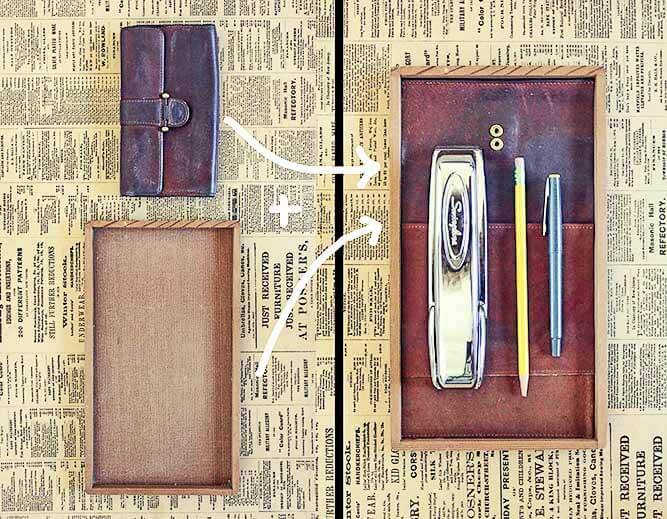 Now, I know I can make a leather catchall and since he has keys and phone all over the place, this will be a win-win situation. I feel the same way, Marwa! Dads are so tricky! I’ve felt that way since I was like 4-years-old. I hope this idea gives you some inspiration! Ha ha the garage inside my bedroom inside my living room is so my style! I’m always dreaming of amazing upcycled furniture but who really has the time! I’m really happy for you Jess that your crochet shoes made such a splash. I know when you work so hard on something it’s awesome to have it loved so much. Congrats and great job.